Insulation and a vent fan are two important elements to help control interior temperatures. This is particularly important to help prevent the van from becoming a nuclear furnace as temperatures in the deserts rise. (Yes, we are mapping in some wicked heat...). We have found that the insulation and reflectix window coverings do an amazing job of keeping the van cool! 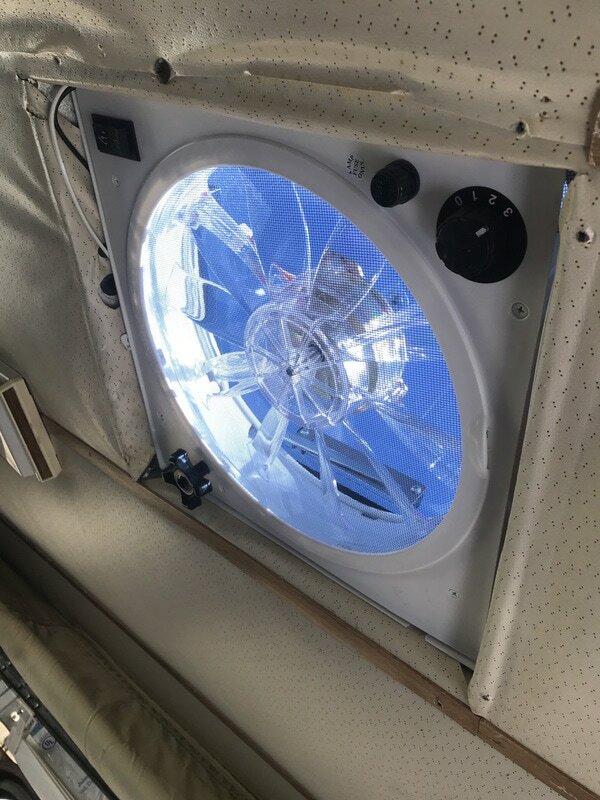 When we hop into the van after a long day of mapping in 100 degree temps, we immediately open the doors, (leaving the reflectix up in all of the windows), then turn on the vent fan on high to push out the hot air and create circulation. While sitting under the fan we drink ice cold electrolyte drink and place cool water on our faces and necks. This works so well we don't even need to start the van and turn on the AC. We can just sit and relax a bit before hitting the road. 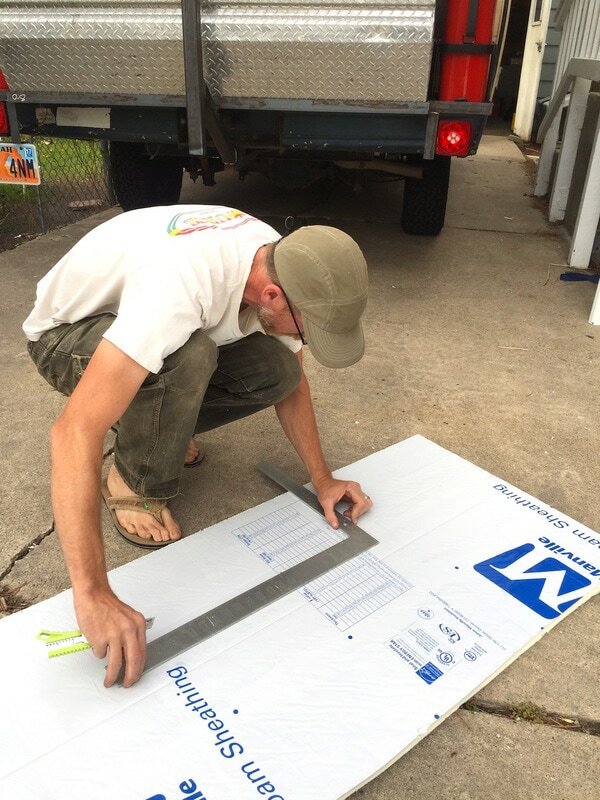 Rick meticulously measured and cut out the pieces, placing them tightly between the frame openings. 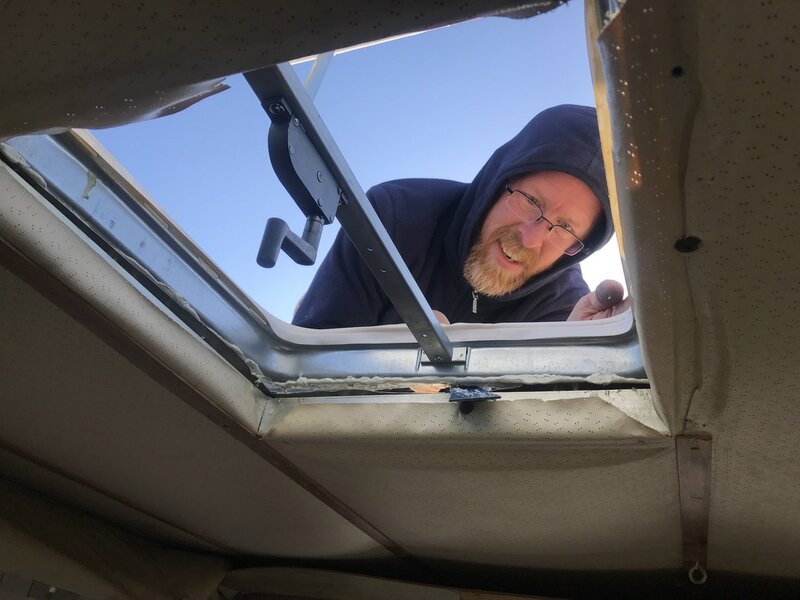 We were initially concerned about the insulation making squeaking noises rubbing up against the metal frame, but we have not found that to be a problem. Perhaps that is because Rick did such a good job making tight junctions and/or the van is so loud when we drive we'd never hear the squeaking over other noises! 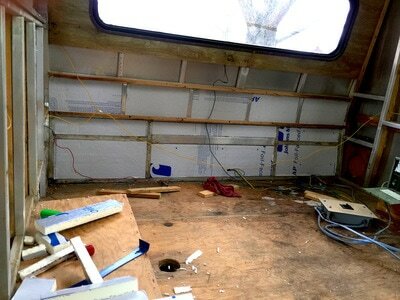 Because there are numerous insulation options, we found the following website very useful in helping us decide which insulation to use: http://www.buildagreenrv.com/design-and-build-information-for-camper-vans/install-insulation/. The insulation (combined with using reflective window coverings and turning on the vent fan) has made an incredible difference in the interior temperature of the van. After mapping in 100+ degree weather, we actually enter the van to cool off! There is not a whole lot to say about the vent fan, except that it is pretty critical for comfort and climate control. There are numerous vent fan options, but we chose the reversible "Fantastic Fan," which allows us to push air out or pull air in as circumstances dictate. Fantastic Fan is one of the more expensive vent fans, but it got high performance and longevity reviews. So far we are very happy with it. It feels and sounds solid. It even has an automatic shut off if the vent is not open far enough.